My plane lands. Here I am, Ireland. Then I arrive at John and Veronica's house. John is working so I am only with Veronica and Corey. They provide me a tour of the house and after we wander. Veronica shows me the Square (it is a huge shopping mall) and the college. I play with Corey. He is so cute! He says "Léa" or "Lady" everytime. So sweet! I eat pastas with John and Veronica. We present us. John plays guitar. Good feeling! 7 o'clock in the morning: Corey is awake and does a lot of noise, but I don't mind, I am tired and I continue to sleep. Then, I meet the grand mother, Nana (Veronica's mum). We speak together about France, their family and news while Corey takes a nap. Nana speaks very fast and she has an Irish accent. It is difficult to understand. After, I decide to go out and meet Marlène, the other French girl who comes from ESDES. We visit ITT and speak about our first feelings. We are excited to be here but it is very different of our French habits (you can discover them here). The weather is too cold: no rain but a lot of icy wind. Families are too nice and great. Rooms are perfects. The environment is quiet. ITT is very modern and looks like great! There is even Starbuck coffee at ITT. I go to at the Spare to buy something to eat for dinner. It is very difficult and strange because nothing is similar to France. Food is very different: not a lot of vegetables, meats, cans, fishes, cheeses, breads, yogourts... But there are 2 shelves of crisps and crackers. I come back home and I meet David and Mégane, two Erasmus who live at home for the first semester. We can speak together. They are very nice. After doing a skype with my family and my friends, I go to bed. Good night everybody! Midday, it's time to go to the Spare (thought of my mum who is the only one to understand: no mum, it is not 'hello it's time to wake up') where I have a meeting with Mégane and David. We go together in Dublin Center with tramway which is very expensive (€5.2 for return). Then I meet Clémentine (a French friend) and Julie (her roomate). 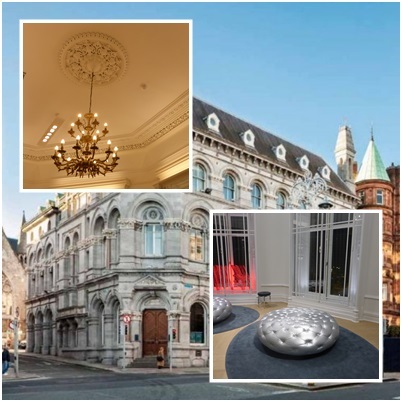 We go to Starbucks coffee, do shopping at a huge and beautiful H&M and Penneys (Primark's name in Ireland) and finally, we visit a little the town. It is shining (but it is cold, like everytime) so it is so cool to take good pictures. When I come back home, Corey is very happy to see me. He would like that I read a story for him and we play with all the family. It is a very great moment and I learn news English words. Very chic shop, I love it! Do you want to see more pictures? Let's go! 10 o'clock, I am at ITT. It is my integration day. I go to the room number 023. There are all the Erasmus students, who are going to study for the second semester. We are about 40 from all over the world (Spain, Germany, Mexico, Hollande... and so many French). Tara, International Officer explain us the structure of the organisation, the academic system at ITT, the timetables, the exams... And finally, the can have a test called EFL to determine our English level. I eat with Petra (from Holland), Marion, Citlalmina (both are Mexican girls), Marlène and Miguel (a Spanish). It is very crazy to eat with people who are so different. It is interesting to be with them because sometimes, we also speak Spanish. Erasmus students look like nice. Everybody is talking, but there are lots of people who don't speak together English but French. Foreign persons speak very well English. I would like to speak like them. I hope so! I go to the college to another meeting with the ITT's staff. I meet new people, very nice. Then, we can take all the timetables and choose which courses we would like to study. We have to take 6 courses (each 5 ECTS). It's very difficult to do our own timetables with courses clashs. Marlène and I would like to have the same courses in order to help each other during the revision period. Some of the Erasmus students want to go out during the night, but I am so tired and I prefer to go home. Maybe tomorrow! It is Saturday and some of Erasmus students propose a free city tour on foot at 2 pm. I'm ready! We meet them at the Mercantile, 28 Dame Street in Temple Bar. 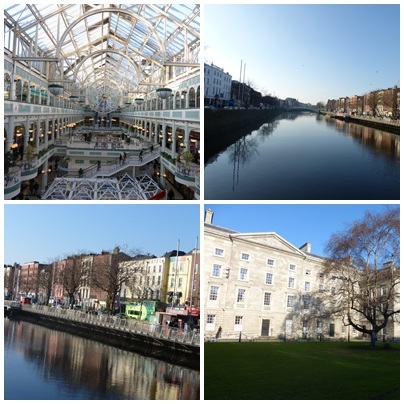 During 3 hours, we walk around Dublin city center. 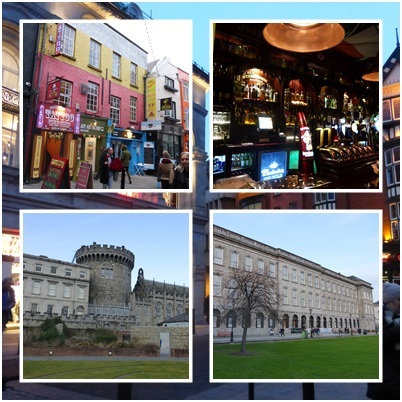 We visit Dublin Castle, Christ Church Cathedral, Parliement, Trinity college, Temple Bar, Saint Stephen Green, the Spire and some of famous streets. It is very fun because we can visit Dublin and meet each other. We go to a bar at 3 pm. It is crazy because the bar is full. There is a live concert: very nice! Then there is a football match: all Irish people are so crazy when they watch the match in the bar. Finally, we eat together and do a party. Erasmus students from ITT are nice. Before going to bed, watch this video. It is in the bar, at 3 pm. Everybody drinks one bear, two bears, three bears... Irish people drink a lot and they are so drunk in the streets from 8 pm. By the way, do you know that the legal limit of alcohol in blood samples for driver people in Ireland is 80 mg/100ml? We are Sunday and all shops are opened, so nice! I sleep until 11 am. I have a bath. I cook. I clean up my bedroom. I do my first washing machine, I am so stressed, but everything is okay and my clothes don't move. I go out with Gaetan and we meet Célia and Linnea (other Erasmus student). We walk, do shopping and visit Tallaght. I come back home, play with Corey, speak with Veronica about charity shop because she will help me to find a job or a shop where I can be volunteer. I do skype with Anthony (my boyfriend) and my family. I book my flights: I will come back in France from the 27th of February to the 2nd of March. Even if I wear a jogging, a t-shirt, a pull, socks, I am so cold. Good icy night! A destination ? Ireland, of course ! First, I am going to present me. study abroad. I chose Dublin, in Ireland. 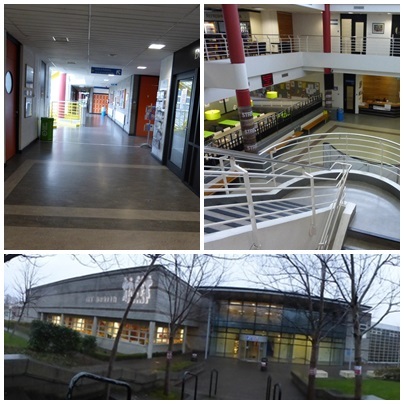 From the 19th of January to the 22nd of May, I will be at ITT Dublin, in Tallaght, a little town near Dublin. Thanks to this blog, you can follow me and my wonderful experience. But why did I choose ITT Dublin ? I had the chance to get know various courtries and I apprecitate their own culture and mentalists. Ireland is a country I have never been to. I went three times to England to do a language course but I would likke to gain an insight into the Irish culture. Nowadays, speaking English fluently has become a requirement for most recruiters. That is the reason why I would like to focus my semester abroad on improving my English language skills, as well as meeting people from other cultures and learning new things. Moreover, ITT Dublin offers courses that interest me very much and some of them, my business school in France is currently not offering.